Want to learn more about ABM? This list features the main influencers in account-based marketing that you should follow today. Last week I met up with the people behind Pinć (Pinch), an under development VR headset that utilizes Minority Report-style user interfaces opposed to the mostly gaming experiences we’ve seen thus far from the competition. Recent smartwatch and head-mounted display launches have caught consumer interest in a major way, but can wearables really be of benefit in the workplace? A great amount of effort is going into developing wearables for the consumer markets, interesting article beginning to explore the use of wearables in the workplace. Be interesting to see where this goes. @thehelpfulimp Working on applications for beacons on both IOS and Android. Understanding human behaviour can ensure we use the connection opportunities provided by beacon based technology, interestingly @Tesco's only using them for service not yet for sales. An interesting add on to CATI interviews, see whether the responses someone is giving over the phone is actually the truth or something they think you want to hear. Hurry up and get your free Word Lens app (and translation packs) before they go away, if they go away. 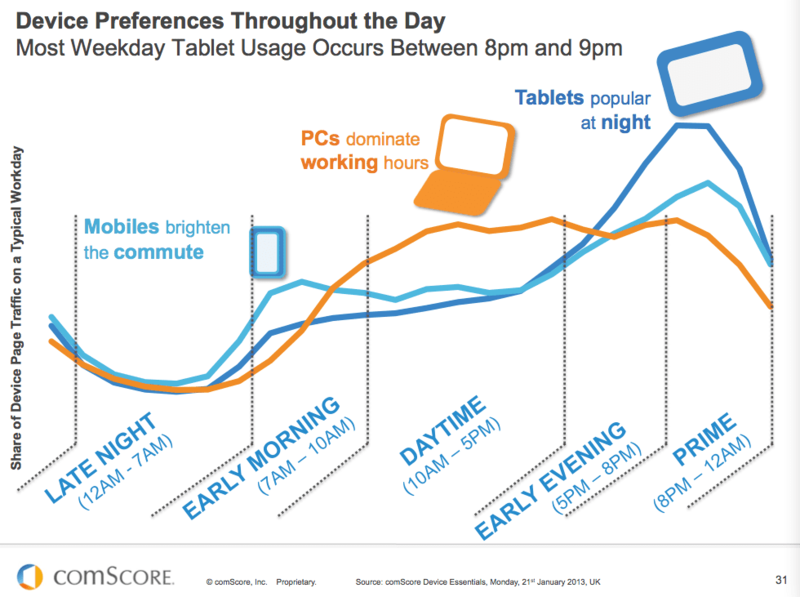 Great graphic from comScore highlighting the switch between devises during the day. Helps as lot when looking to understand the variance in research technology required when looking at what happen across the day. Tablets for catch up TV late at night are now a integral part of our media mix. A recent study revealed that 99% of brands are on Twitter. Although small businesses may have paved the way for Twitter marketing success, the world's largest brands are adopting the platform a both a customer service and marketing tool at an increasing rate. Which brands rule twitter? Customer service, sales, social commerce, fundraising and authenticity. A visual breakdown of brands which use twitter to engage with their consumers effectively. These are the digital marketing skills advertising and Fortune 500 marketing executives value and need the most for 2014. Interesting graphic for those looking at training options either for that new job or leaving school, sticks with maths and statistics and add in a little common sense. Interesting to consider as well from various roles/ fields -- what are the missing skills in social media amongst teachers, nurses, social workers, parents, students, police officers etc. Would be more impressed if they were teaching it to teach humans common sense. Be interesting to do something similar for video analytics in market research. Robot's reaction time to human that fast that the human doesn't notice it cheating. Has to be a research application in there some where, perhaps a camera based solution that looks at your emotion and changes the next question based on what it sees. Could think of a whole number of ways this could be used in research, and in my own life. No more waiting at the train barriers for one. So a computer passes the turing test, what might we expect the first applications to be? Sure this will be of interest to the market research and business development community. Big step forward for market research if we can run IOS and Android apps on a single platform. Further reduces hardware costs of research technology. Generally if you can think it then someone has built it, Alibaba is the place to go. Why is this important for market research? When helping your tech clients, go see whether it has been built. Great for creating feature sets on next generation tech solutions. Good article on predicting trends and understanding when technologies bcome feasible for widespread adoption. William Hertling has kept a spreadsheet he uses to predict technology trends for almost 20 years. He uses simple metrics and estimates annual growth rates in performance to give insight itno when technologies will beocme widely available to the crowd. He argues that once a given technology achieves a cost performance ratio that is accessible to the mass market - thats when certain innovations will almost inevitably occur. Using video streaming, AI and other examples to illustrate his methods - its a great read if you are intereted in exploring future technolgy trends or making bets on tech developments. Click on image or title to learn more. With more than 600 rounds fired in theater to date, Excalibur™ is the revolutionary precision projectile for the U.S. Army and Marine Corps artillery. It's safe to assume Topsy won't be the last social data company scooped up over the next year or so. Here are a few other startups to keep your eye on. It knows when you last visited, what you bought, and how long you're likely to browse before making a purchase. Interesting potential for this shop of the future, individual and specific offers, could identify if someone is at a shelf and trigger surveys, targetted marketing, reminders from home!